Looking for lateral links for your Subaru WRX/STI or Impreza? You have come to the right place. 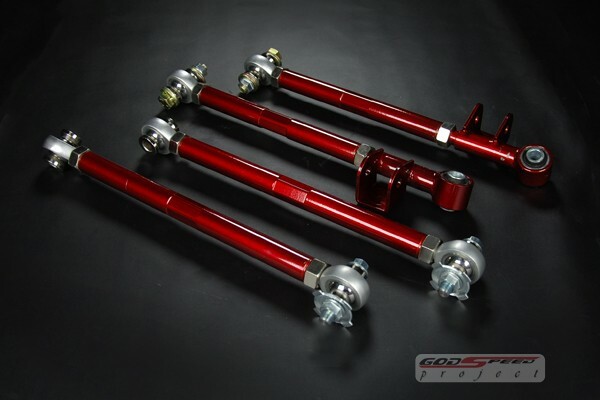 We offer Godspeed Lateral Links for Subaru models. Godspeed lateral links will allow you to use much more aggressive alignment settings than stock suspension. This will enhance the handling and cornering of the vehicle. Godspeed Lateral Links are constructed for comfortable ride yet maintain good performance compare to stock rubber mount will which wear out in couple years. Our lateral links will last you at least 10+ years. Additionally this will easily out perform the stock lateral link. The staff is standing by to assist you if you have any questions. What does a lateral link do? It’s purpose is to control unwanted force under acceleration and braking. Godspeed’s pillow ball lateral links are designed to secure traction in drifting and provide stability during acceleration under high speed cornering. Furthermore adjustment is provided for toe-in and toe-out settings. Dial in the alignment on your Subaru today!